There are no elaborate pretenses to Vagabon’s music. Laetitia Tamko’s technique begins with her own memories and vulnerabilities, which she pours into powerfully understated songs that feel less autobiographical than they do existential. Tamko, 24, was born in Cameroon, attended high school and college in America, and worked as a engineer before finding an artistic home in the Brooklyn DIY scene alongside friends like Frankie Cosmos. Last month, she released her eight-song debut album Infinite Worlds: two short sets of raw and intimate, soft-edged guitar rock, bridged together by the woozy synths and vocal loops of “Mal à l’Aise,” which closes side A of the record. Most recently, Tamko and her new backing band (including acoustic drums and bass) are touring with Allison Crutchfield. I sat down with Tamko during South by Southwest, just ahead of Vagabon’s performance at SPIN’s afternoon showcase, to talk about her artistic journey. Infinite Worlds by Vagabon This is your first time at SXSW—what are your impressions so far? So far so good. This is part of a 40-day tour, so it’s still the early part of it, so I’m still conserving energy, but so far I’ve loved every show that I’ve played. What motivated you to come? Well, I just put out my first record two weeks ago, and was doing this large tour supporting it, and it just happened to be at the same time at South By, and I had played Austin, but not South By, and I thought it just made sense with the route of tour. And all these shows are so cool, and people that I really love are also playing. Who’ve you seen so far that’s impressed you? Jay Som. She’s amazing. That’s the only person that I’ve actually seen. I usually just like, play, and I go to bed. She’s great. Let’s talk about your record a little bit. One of the really remarkable ones is “Mal à l’Aise.” It’s sort of an ambient composition, and it’s different than a lot of the other stuff on there. Can you talk about where that came from? Well, I wanted to put a sort of “palate cleanser” in the middle of the album to give a break from the rock or punk instrumentation, and also some air to breathe, and then get whoever is listening to it ready for side B. So it falls purposefully at the end of side A, and then trickles on into the rest of the album. I was just experimenting a lot in that time with producing, and using samples, and making sound collages, so that’s where that comes from. Is that a direction you think you’ll do more of in the future? “Mal à l’Aise” is in French. Is writing in French a different experience than writing in English? Writing music in French, yeah, is something I haven’t done until this song. It’s definitely different, but French is my first language, so it doesn’t feel all that different. Music began as a hobby for you. Are there some trade-offs you’ve had to make by taking it pro? I don’t know if there’s a distinction between hobby and pro. I think, before, I was just like, crafting it, getting it together. It’s true that I never considered this would be my career—because I didn’t think it was possible, but not because I didn’t think I could. I feel incredibly grateful that I get to do this. Once you see any sort of affirmation that oh, this is a thing people do, this is a thing that’s possible, it changes the game. But I always took this seriously, you know, from the moment that I picked up any instrument. Not that “hobby” implies that you don’t take it seriously. To not listen to other people—when other people tell you [that] you can’t do something, if you feel like you can. I think people are capable of summoning really powerful energy within themselves that can take them to reach a lot of things that they want to. I’d tell my younger self to not be discouraged by people saying that that’s not a real thing. 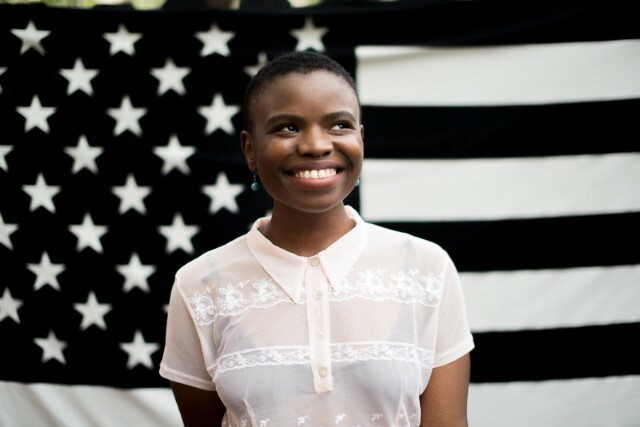 What’s your greatest ambition for Vagabon as a project? I don’t really think of it in a linear way like that. My immediate goals are to constantly be growing. I wanna see my audience grow, I wanna see myself grow as a musician, I just wanna see things progressing. Maybe in six months I’ll have some sort of goal. I don’t really have accolades that I wanna hit. I’m in this for the long haul. I think setting up goals is really great, but I also don’t want to think of them or speak of them cause it’s kind of like, once I reach them, then what? In some past interviews, you’ve talked about the idea of pop music as a democratizing force. Where do you see your own work fitting into that? Would you want to be so popular that you were ubiquitous, or is that not for you? I think that I want a lot of people to listen to my music and to like it. If I can sell out every show on a tour—amazing! That’s my job as a musician, or it would be great as a musician to get that. But as far as being known as a person, I care less about that, and more about people knowing my music. Whatever happens, happens. I feel like I have two feet on the ground. The music is more important to me. I’m not, like, a socialite, I’m not very social at all. I give the most of me when I’m performing and that’s what’s most important to me. Are you writing new music? What’s coming next? I’m writing new music, without any pressure. Just slowly, but surely. I’m touring most of this year. I’m jotting some things down on the road, but will actualize them when I get back to New York. I wanted to reference what you said in the past about wanting girls, and especially black girls, in the audience to see you as a role model. Now that you’ve been out on the road, have you seen any of that start to happen? I definitely don’t want to be a role model—or I’m not trying to be a role model. It’s good to be able to see the people who come to shows. A lot of people have been grabbing from that quote that I said about black girls—yeah, they’re important! That’s who I wanna see. It’s the same thing I say all the time. I’m just being my authentic self. I don’t have an agenda to be someone’s hero or anything. I’m just doing me, and if it heals and helps someone else, that’s even more incredible, and I’m even more grateful for that.